The Mummy is an action/adventure movie set in modern day. The actions of treasure hunter Nick Morton (Tom Cruise) set in motion the release of Ahmanet (Sofia Boutella), an evil Egyptian princess who was buried (and mummy-wrapped) alive by the ancient Egyptians. 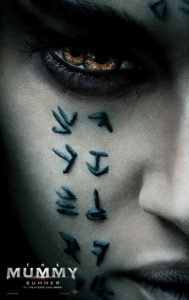 The Mummy also begins with a Universal “Dark Universe” logo, indicating that this is another attempt by Universal to create a cinematic universe for their classic monsters. The problem is that The Mummy is short on story and ideas and tries to stay interesting with wall-to-wall action sequences full of effects and the charisma and star power of Tom Cruise. For a movie that has so little story, it’s amazing how much of it is told rather than shown. The female love interest becomes involved in the story because Nick stole a map from her after a one-night stand. By not showing that scene, we have no additional information about who these people are. The mythology of the movie and Ahmanet’s goals are spelled out over and over again. Instead of something new being revealed at regular intervals it feels more like the movie is just reminding us of what Ahmanet wants while slowly moving in that direction. It’s long and pointless. Tedious. Boring and repetitive. Don’t bother.